Yes Target! Although we’ll be so happy when we can go outside for our Tuesday evening Urban sketching again, sketching at Target was a lot more fun than you might think. I had fun sketching the silly high heels and flip-flops on the wall behind them. Nobody seemed to notice or question why I was painting in the shoe department. 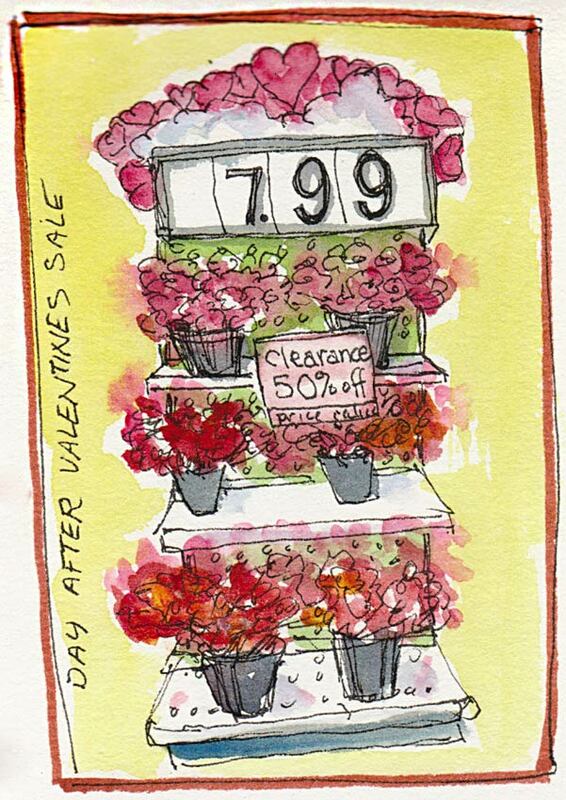 It was the night after Valentine’s day and there was the display of sad, wilting Valentines roses, on clearance, half off. Whatever happened to sitting in a rocking chair holding the baby in your arms? This contraption had a touch pad remote control with 6 speeds and more. Someone told me he bought one of these only to discover it came in a million parts that was a nightmare to assemble. I’ve never sketched in a store. Interesting results!! 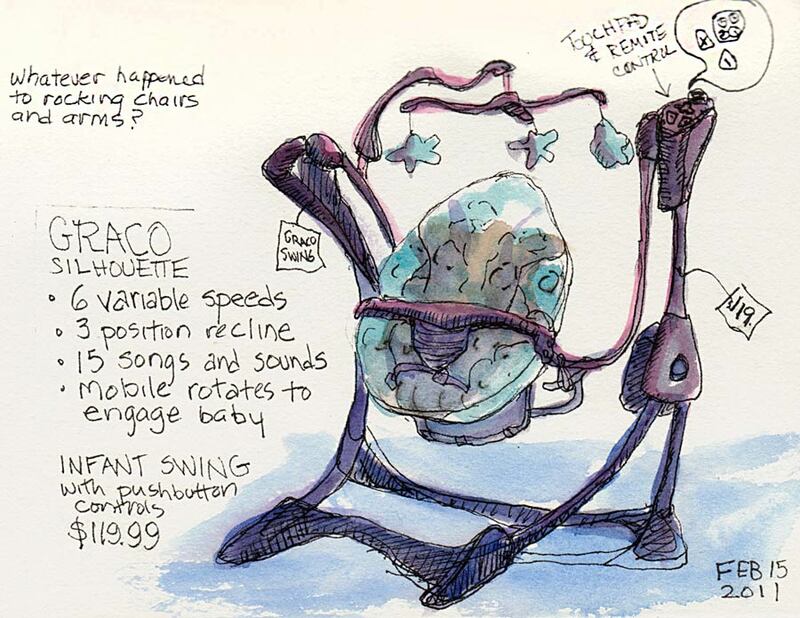 That baby chair is just mad, but a fabulous sketch of it. I hate to say this but you could drop down into a coma on the floor at Target and no one would notice. So, sketch away! Lord save us, an automatic baby rocker?! Thanks for an interesting post. Your sketches are great as always, but I would never have picked Target!!! I’m limited by my imagination, obviously! 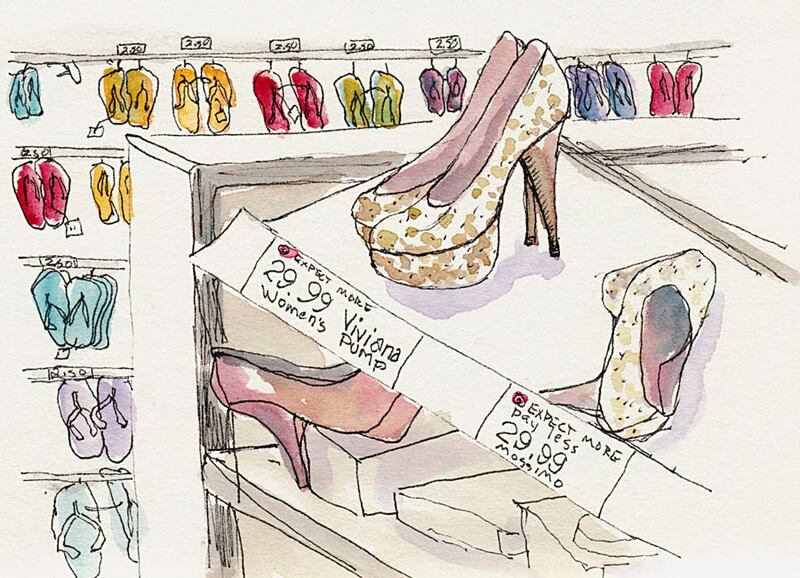 “Nobody seemed to notice or question why I was painting in the shoe department.” – oh Jana – this is so typical for our society – you could not have expressed this better! But still I had a good chuckle about it. What would happen if you did this in the changing room I wonder. Would be the real crash test – wouldn’t it? The sketch about the automatic rocking chair is really a hoot!!! I love your sketches, I’m so glad I found your blog! I also adore Target, and haven’t ever thought of sketching IN a store like that… great work! Wow! You are seriously brave! But it looks so fun, now I want to draw at Target. The shoes are fabulous. And the baby swing, perhaps it has finally found a worthy purpose as art! Already assembled, of course.